INFASHIONLOVE.COM: Summer Morning Skincare for Oily/Combo and Blemish Prone Skin! 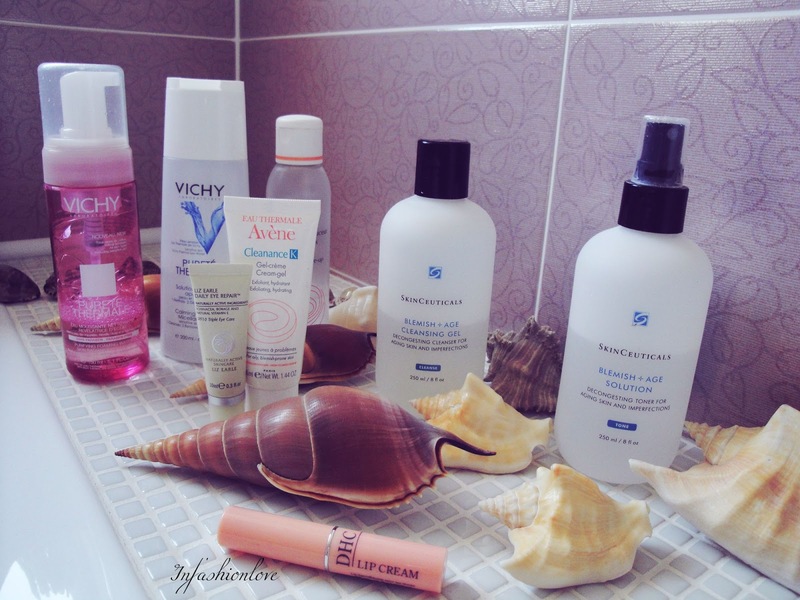 Summer Morning Skincare for Oily/Combo and Blemish Prone Skin! Hello Beauties, I've haven't blogged for a bit and really have missed it. I celebrated my big birthday, tho still feeling like 25 over and over and over. As I desperately needed a bit of a break, next day I woke up with a full blown flu and some irritation on my eyelids, so I haven't worn make-up in days and just now starting to recover, so that's why you haven't heard from me for a while. I decided to update my skincare routine as it is summer, and those of us with oily/combo skin type get even oilier and pores tend to get blocked and spots and blemishes go slightly out of control. I used to have acne for years so I'm very careful with my skincare, and even though I only get a spot here and there now I still make sure to look after my skin thoroughly and not provoke any breakouts. Hot summer weather can be terrible for oily skin so I find I need problem focused skincare products. 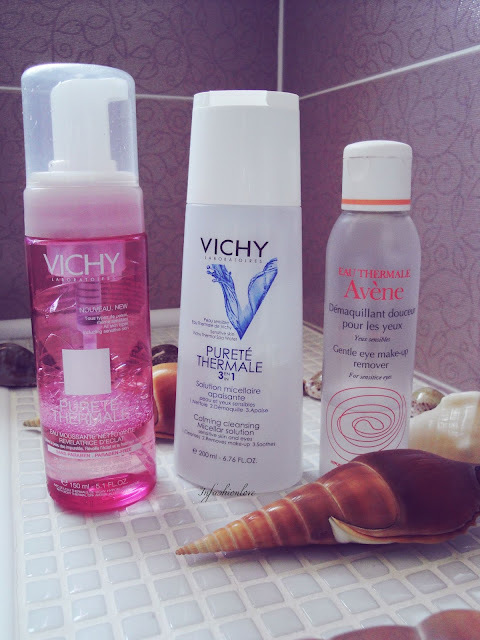 I start by taking off my night skincare with Vichy Purete Thermale 3in1 Calming Cleansing Micellar Solution. I lost count how many bottles I've been through, as soon as I run out I get a new one, I find it's very gentle and a great make-up remover and cleanser. It's really soothing and great for sensitive skin and eyes. Then for my eyes I like to use Avene Gentle Eye Make-Up Remover for sensitive eyes, although I use Vichy on my eyes most mornings too, I sometimes like the additional fresh and cooling effect of the gel texture on my eyelids. For the face, depending how my skin is feeling, if I don't have spots I cleanse my face with Vichy Purifying Foaming Water, Skin Radiance Revealer. It removes the impurities and restores skin radiance and freshness. 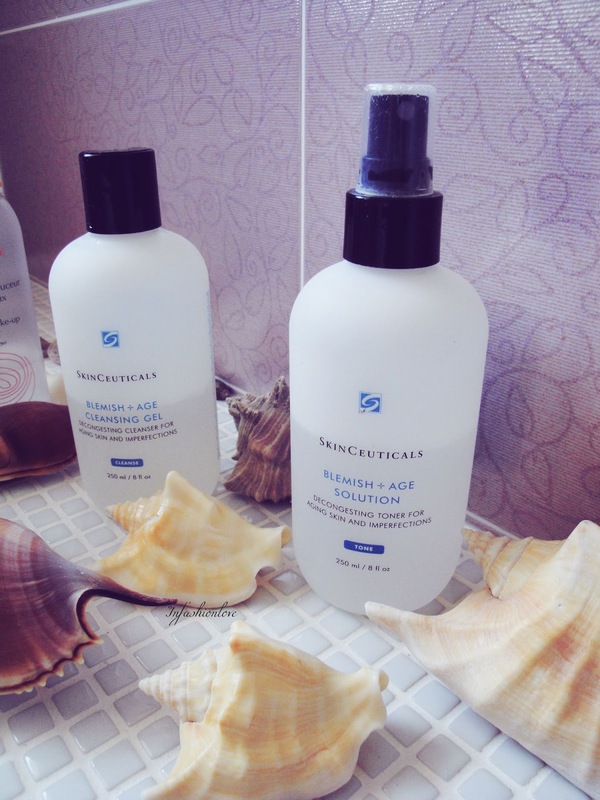 However if I do have a spot on the radar I always wash my face with SkinCeuticals Blemish+Age Cleansing Gel, which is a decongesting cleanser for aging skin and imperfections [anything after 28 is aging in my book]. Also when ever I use this type of cleanser I always wash it off with one of those facial sponges, they give you extra bit of exfoliation. And I also like to follow up with the tonic from the same range, SkinCeuticals Blemish+Age Solution. It comes in a spray bottle, you just spray couple of times onto a cotton ball. Then I apply Liz Earle Daily Eye Repair, which is a SPF10 Triple Eye Care with Echinacea, Borage and natural Vitamin E and Avene Cleanance K Cream-Gel over my face, which is a exfoliating moisturiser. And then do my make up or if go straight under the sun then I apply a heafty SPF like Sensai Silky Bronze Sun Protective Cream for Face SPF50, which I will blog about separately. Also I find that my lips tend to dehydrate during summer, so I use the DHC Lip Cream throughout the day topping with the spf. This routine seems to get things back on track even if I do get a few spots right at the beginning of changing climate etc after a few days my skin starts to clear up again.